On June 17, 1885, a French ship, the Isère, arrived in New York Harbor laden with very special cargo—more than 200 crates filled with enormous pieces of copper and iron that, once assembled, would form the towering sculpture dubbed "Liberty Enlightening the World"—what the world knows today as the Statue of Liberty. Here at the National Museum of American History, we had our own statue delivery. On March 2, 2017, representatives from the LEGO Group arrived with a 9 ½ foot (or 300 brick) high model of the statue for installation on the museum's first floor. Once installed, it became the first landmark of the theme we celebrate this year—"The Nation We Build Together." She might be front and center, but this LEGO model isn't the only Lady Liberty in the building. In fact, a journey through "The Nation We Build Together" offers multiple versions of this iconic sculpture, each with its own unique story and meaning. On June 28, the museum will debut our newly transformed 2W wing featuring exhibition spaces and hands-on experiences in which we invite our visitors to explore the ideas and ideals of the American people. Among these are two major exhibitions that provide a fresh and challenging look at ways in which those same people made the nation. American Democracy: A Great Leap of Faith explores how the nation's revolutionary decision to abandon a monarchy and base its government on the sovereignty of the people left each generation that followed to answer fundamental questions: Who should participate and what role should they have? What common principles and ideas are necessary to make government by the people possible? Many Voices, One Nation maps the cultural geography of America to discover how the many voices of its people have shaped the nation and its communities, fulfilling the Latin aphorism on the Great Seal of the United States—E Pluribus Unum ("Out of many, one"). Amidst hundreds of objects newly on display, both of these signature exhibitions feature multiple depictions of the Statue of Liberty. Certainly, the meanings of Lady Liberty are as diverse as the nation she represents. She has been a monument to the abolition of slavery, a token of the lasting friendship between the people of France and the United States, a figure of welcome for those looking for a new life in America, a beacon of democracy, even a site of protest and dissent. Regardless of how she has been understood over our history, the Statue of Liberty has been, and continues to be, an essential piece of the nation we build together. Beginning June 28, we invite you to explore all that our new wing has to offer, and while there, take some time to look out for Lady Liberty and think about the meanings she might hold for you. This small model of the Statue of Liberty, made of terra-cotta and tin, was created around 1884 and based on maquettes created by the statue's sculptor, Frédéric Auguste Bartholdi. It was donated to the Smithsonian in 1885, around the same time that the original statue was making its way to America aboard the Isère. Models like this one were sometimes distributed to individuals who donated funds for construction. That same year, there was a renewed push in fundraising under the direction of Joseph Pulitzer, the publisher of New York World. Through impassioned calls for action in the newspaper, the World received over $100,000 to complete the statue's pedestal, with most donations under one dollar. The Statue of Liberty appears as one among numerous symbols and scenes that represent and celebrate the history of the United States adorning this amazing timepiece. 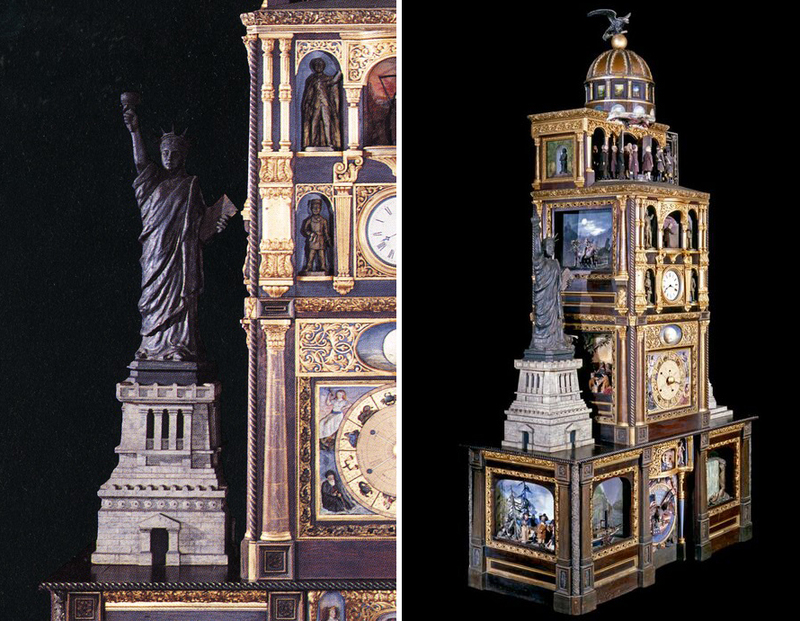 The Historical Clock of America is an example of the short-lived phenomenon of building monumental clocks in the late 19th century, when U.S. clockmakers pushed to craft grand creations to rival the cathedral clocks of Europe. It was designed and built around 1893 by a Boston craftsman and stands over 12 feet high and 7 feet wide. Like other such clocks of its day, the Historical Clock of America toured the world, and was displayed as far away as Australia and New Zealand. One of the highlights is a clockwork procession of U.S. presidents, from George Washington to Benjamin Harrison. The Statue of Liberty flanks the clock across from a representation of the Soldiers' National Monument at Gettysburg. Created by artist and community organizer Kat Rodriguez, this interpretation of the Statue of Liberty was a focal point for a protest march organized by the Coalition of Immokalee Workers (CIW) in 2000. As part of the "March for Dignity, Dialogue, and a Fair Wage," she was carried by marchers over 230 miles between Fort Myers and Orlando, Florida, as a call for improved conditions and higher wages for agricultural workers. Rodriguez's depiction of Lady Liberty, complete with tomatoes in place of her typical torch and tablet, serves to connect the struggles of diverse migrant farmworkers with the promise of America as represented by the original Statue of Liberty. Originally published in 1943 by the Immigration and Naturalization Service of the U.S. Department of Justice, this guide features the Statue of Liberty prominently on the cover. The manual was intended for judges, civil servants, and others "to dignify and emphasize the importance of citizenship." This included details on the form and meaning of citizenship ceremonies, as well as the history and celebration of "I Am an American Day." In its section of "Source Material," the guide also featured patriotic hymns, songs, and speeches, as well as excerpts from foundational documents that immigrants to the United States were expected to study to earn their citizenship, such as the Declaration of Independence, the Constitution, and the Bill of Rights. Manfred Anson (1922–2012) designed this unique Hanukkah lamp (or menorah) to celebrate the centennial of the Statue of Liberty in 1986. Born in Germany, Anson was able to escape to Australia as a refugee from the Nazi regime prior to the war. In 1963, he immigrated to America to join his sister, Sigrid, who had survived the Holocaust. Anson became an avid collector of memorabilia that celebrated his new home. In creating the design for his menorah, Anson used 19th-century souvenir Liberty figurines as the basis for the candle holders, and topped the lamp with another common American symbol, the eagle. Each small statue is also engraved with the name of a person or event central to Jewish history. Before the Statue of Liberty became the foremost female figure to symbolize the nation, there was Columbia. Commonly depicted as the personification of the United States, this goddess of liberty usually wore a Phrygian cap, the classical symbol of freedom (and a feature shared by Marianne, the symbolic representation of the French Republic). This hand-carved wooden version of Columbia was erected atop the pilothouse of the side-wheel steamboat Mary Powell in 1864. Known as the "Queen of the Hudson," the Mary Powell transported passengers daily during the summer months between Kingston, New York, and Lower Manhattan. The figure of Columbia, our first "Lady Liberty," was saved when the Mary Powell was retired and broken up for scrap in 1923. Tim Winkle is the deputy chair and curator in the Division of Home and Community Life.